The first leg of our tropical honeymoon odyssey brought us to Blancaneaux Lodge in the Cayo district, deep in the Mayan Mountains located near the border of Belize and Guatemala. Believe it or not, we were actually in a Pine Forest! 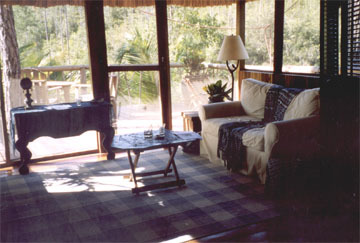 The lodge offered full breakfast as well as Italian style lunch and dinner menus. 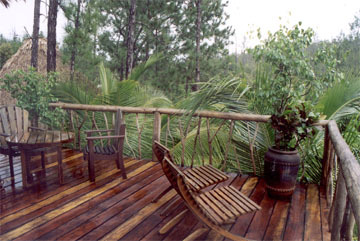 During our four night stay at the hillside resort, we took numerous day and half-day trips out into the Belizian jungles. 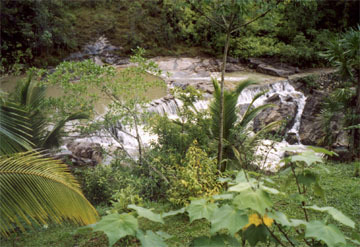 The picture above shows the front porch of our honeymoon cabana, which overlooks a beautiful waterfall, pictured to the left, on a tributary to the Macal River which is a major waterway in Belize. On the bottom left, is the screened in living room, which went out to our porch. 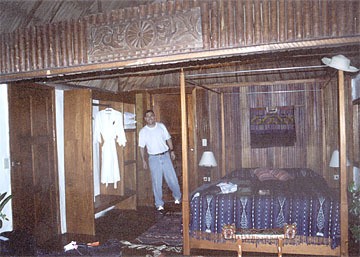 It was separated from our sleeping quarters, below, by hand-carved, bi-fold doors offering the honeymooners some privacy. The bathroom was behind the wall at the head of our bed.